There are many reasons why I find Julia Child inspiring. Her passion for good food is foremost among them. But as I’ve been making my way through her posthumously-published memoir My Life in France I’ve fallen in love with her for many other reasons. She was nervy and determined. She was a bit of a bohemian. She was an intrepid rookie with the French language. She was a beloved misfit in a nation of prim and tiny women. She was staggeringly in love with her husband. She didn’t take herself too seriously. These are all both laudable and endearing in the same breath. But I was bothered by my lack of emotional and intellectual development. I was not as quick and confident and verbally adept as I aspired to be. … Upon reflection I decided I had three main weaknesses: I was confused (evidenced by a lack of facts, an inability to coordinate my thoughts, and an inability to verbalize my ideas); I had a lack of confidence, which caused me to back down from forcefully stated positions; and I was overly emotional at the expense of careful “scientific” thought. I was thirty-seven years old and still discovering who I was. 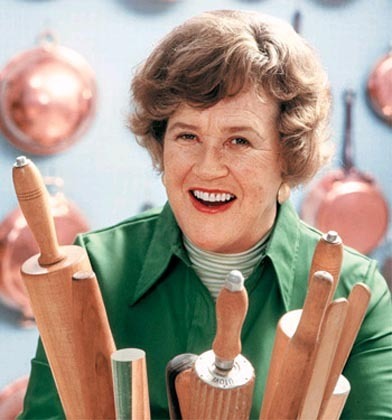 It is well-known that Julia Child didn’t discover her passion and talent for cooking until she was in her late thirties, and her famous cooking show “The French Chef” didn’t debut until she was 50. But the quote above resonated with me even more than her late-blooming career. For her struggles in this vein are highly similar to demons I’ve battled many times myself. I am thirty-three now. I am a wife, mother, and professional. I have a graduate degree. I should be able to defend any position I have, right? I’m not so sure. What I do know with certainty is that I continue to struggle with many of the same issues that our beloved Julia describes. When challenged I sometimes become nervous and emotional, rather than confident and knowledgeable. I have become comfortable with many of my beliefs without first really questioning why they are so. And when situations arise that call for me to explain or defend myself I rarely find myself short of words, but often find myself short of well-formed thoughts. When I am flummoxed I get quiet. And for any of you who know me in person you know that “quiet” is a highly out-of-character state for me. But it seems I am in good company. I’m learning from her memoir that Julia Child was a work in progress – an unfinished product – throughout most of her adult life. I find this heartening on a number of levels. First, it spares me the shame of not having it all worked out yet. Second, it means that I have a lot of living yet to do. (How sad and dull life would be if by the age of 33 there were no mental gymnastics left for me to attempt.) And lastly, it reminds me that no matter how much of my world view I am able to articulate, there is always more to learn. This entry was posted on Friday, October 1st, 2010 at 5:00 am	and is filed under Change, Choices, Culinary, Culture, Reading. You can follow any responses to this entry through the RSS 2.0 feed. Both comments and pings are currently closed. I find it interesting that you occasionally feel yourself “short of well-formed thoughts”. So many times, I have read something on this very site that puts into words something that I am feeling or thinking far better than I could have said it myself. And you say it so succinctly! I appreciate your view on Julia and I also enjoy that I don’t know it all and am continuing to learn. I think Julia Child is such an inspiration. She sends such a powerful message: Don’t Ever Think You’re Finished! I need to remember that more; I tend to get discouraged so easily. Anna – Thanks for this lovely compliment. One of the great things about blogging is that it allows me to explore and articulate my thoughts on my own time. I have the liberty to mull something over until it is fully formed in my mind and only then write about it and publish it. It is in the heat of the moment of a live discussion or debate that I tend to lose the ability to express myself with clarity (at least in situations where my convictions are less firm). It reminds me of Meg Ryan’s character in You’ve Got Mail. It’s such a breakthrough for her to finally say what she means to say in the moment she means to say it (when she berates Tom Hanks in that coffee shop), rather than creating the perfect retort only after the moment has passed. I’m still waiting for that breakthrough myself. I just hope I don’t regret it later, as she does in the movie. I too feel so unfinished. I work primarily on emotion and though I FEEL well thought out. I don’t articulate myself that way. It’s the THINKING I often need to do. I love that you brought up You’ve Got Mail. One of my favorite moments in that film is when she talks about her business. “If your business isn’t personal, what is personal? It’s what you do all day long” That’s not the quote, but it’s like that. Her idea freed me. She told me in that film that I could be emotional about my life and that’s OK. It won’t stop me from trying to do a bit of thinking as well. I’m 40 now and I’ve discussed with other women my age about how there is something about the age of 40 where you become (realize?) some level of confidence that was previously unknown to you before. I have confidence in my opinions but also confidence in knowing that I can change my mind – and need to keep an open one. I’ve never known anything about Julia Child but she sounds inspiring. I can’t wait to read this book. I fell in love with Julia Child (or at least Julia Child as portrayed by Meryl Streep) while watching Julie & Julia and I know I will enjoy reading more about her life. Thank you for sharing your impressions of her – and of yourself through the lens of Julia – from one work in progress to another. Yes, Julia is a comfort to me. When I think, “yikes, what should I do with my life”, I think of the fact that she hadn’t even started cooking at my age. Comforting indeed. So funny, a friend and I were just having this same conversation (not about Julia Child) since we both turned 35. We both felt like we would’ve had it together mentally and emotionally by now! On paper, I suppose my life is where I thought it would be, just not in my head. Thanks for posting this – came at a really relevant moment for me. What a lovely post. And a wonderful reminder that it’s “okay” to feel like a work-in-progress. As for confidence, like other aspects of self, I believe it comes and goes, and it varies depending upon context. Often, those we think are the most confident don’t feel it on the inside. And others are quietly confident, and display it in different ways. I felt the same way artier reading Eleanor Roosevelt’s autobiography. Life is a process, you can’t be finished until you are finished. I agree Gale…I loved this book and I find Julia Child incredibly inspiring. What really struck me was just how much herself she was. She was unabashedly Julia. The best and the worst bits all included. In a world of facades where we are all supposed to be, or pretend to be, near perfect reading about Julia felt like touching real life. Passionate, messy, a work in progress. She seemed to just let her life unfold organically, at it’s own pace, and what a fantastic life it was.